Bike Shelter spaces provided. On average, we have 10%-15% students cycling to school each day, regardless of weather. Our Environment Committee started a ‘Walk-to-School’ Initiative in 2017-18. This has resulted on between 15% and 20% students walking to school each day. Our Coiste Glas (Environment Committee) also run an initiative where students are encouraged to walk the final 200m-1000m to school. This has resulted in some people being dropped at the Community Centre, others outside the Community School/Gaelscoil, some outside the Church, etc. This has again reduced the volume of traffic entering the Waterpark House area. On Tuesday and Thursday, we offer Supervised Study. This means that at least 30% of students don’t leave the school until 18:00. This again reduces the amount of traffic at the school at 3:40 (home-time). On Wednesday, after-school activities are offered in Carrigaline GAA. There could be anything up to 45% of students walking to the GAA every Wednesday, thus not requiring collection from the school at 1:05p.m. (home-time). These students are then collected from Carrigaline GAA at 2:15p.m. On Thursday’s, our Transition Year students will be part-taking in Voluntary Work, meaning they will leave the school at 13:05. This will further reduce volume of traffic at home-time on Thursday. The school opens at 07:50a.m. Classes do not begin until 08:50. Many students arrive early, and activities are provided for them, to encourage them to come to school early. The stream of students arriving to the school from 08:00 onwards is very steady, meaning that traffic congestion from 08:40-08:50 is minimised. A Traffic Mobility Manager will oversee and review Traffic Movement on and around the school grounds. 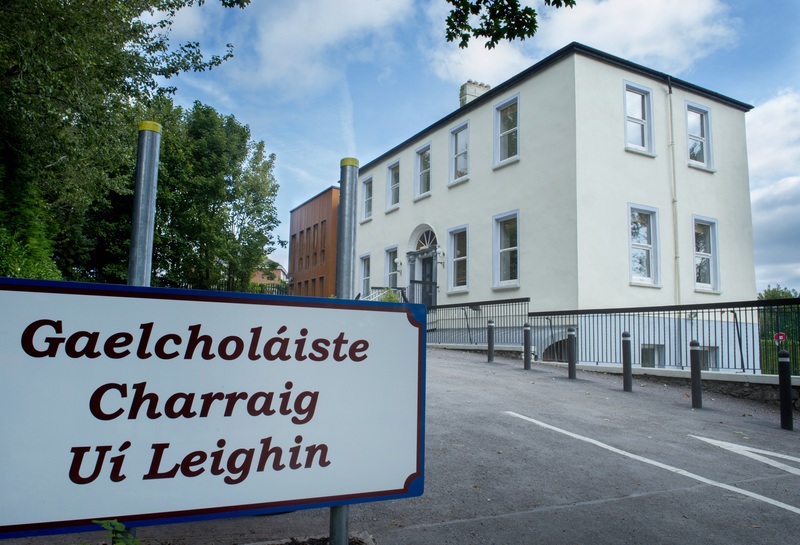 Monthly review meetings of Traffic Management will take place between the Traffic Mobility Manager, School Management and the Coiste Glas, or more frequently if required. The Traffic Mobility Manager will also work in conjunction with the Coiste Glas (Environment Committee) to find further ways of encouraging other Travel to School initiatives amongst students and parents. We also have Car-Pool arrangements for students. In all, we have four car-pools, which carry 22% of our students. We also have a traffic steward that assists in directing traffic at morning drop-off and evening pick-up. This has further helped traffic flow at these times. A bus will serve those students coming from Douglas, Passage West, Monkstown and Cobh areas in 2018-19, meaning that 20% of the school population will travel by bus to the school. This Travel Plan is available on the School Website. It has also been shared via email with all parents and students.